Iceland is an outdoor-lover’s paradise. 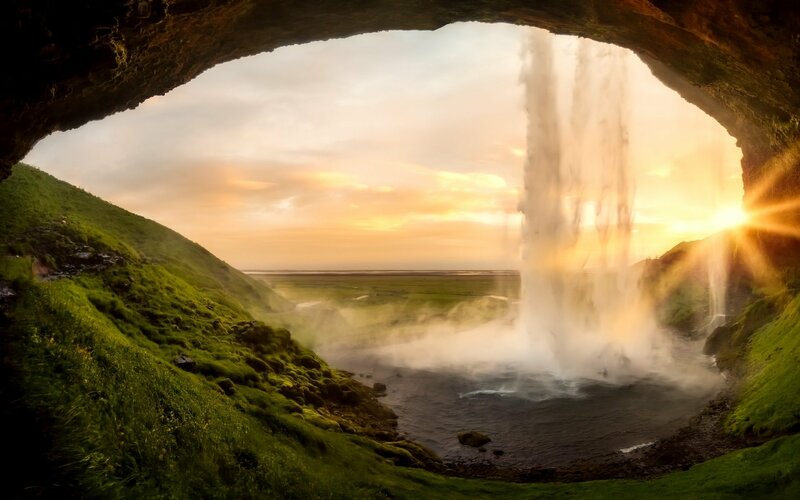 As you’ve probably seen in famous scenes from Game of Thrones, Iceland boasts some of the most strange and captivating landscapes in the world. From moss-covered rocks to striking mountains, volcanic beaches to glacial lakes, it’s the perfect outdoor playground to explore. If you want to experience this beautiful country fully, camping in Iceland is a must. Additionally, for travelers on a budget, one of the best ways to experience Iceland while saving money is – you guessed it – camping. All around the country, there are designated camping areas that range from free (yes, seriously) to ~$15 per person. To help you plan your road trip around Iceland’s Ring Road, we’ve compiled everything you need to know to go camping in Iceland in this comprehensive guide. This page includes affiliate links. Using these links to make a purchase supports Jetfarer at no additional cost to you. As always, we only partner with affiliates that we have tried and tested ourselves, and that we personally recommend. Why Should You Go Camping in Iceland? What Are Iceland’s Campsites Like? What About Wild Camping in Iceland? If you’ve ever read posts on the internet or heard friends talk about Iceland, you’ve probably heard things like “it’s so beautiful” or “it’s a new up-and-coming destination.” What you probably haven’t heard as much is that pretty much everything Iceland is ridiculously expensive, especially accommodation. With hostels costing $40-50 USD per person per night for a dorm bed, bare-bones guesthouses starting at over $100 USD, and hotels costing over $200 USD, you can probably imagine that costs rack up super quickly here. As you can see, camping is around 10% of the cost of staying in hotels. Cool, huh? I thought so too. An even better perk of camping in Iceland is front-row access to the country’s most beautiful landscapes and sights. Who wouldn’t want to sleep right next to a raging waterfall, or a black sand beach, or a striking rock formation? There’s really nothing like waking up to the sounds, sights, and smells of nature all around you, and this perk is exclusive to camping in Iceland. Campsites near interesting landscapes and views are abundant, whereas finding other types of accommodations in those same places is nearly impossible. Take that, hotels and hostels! 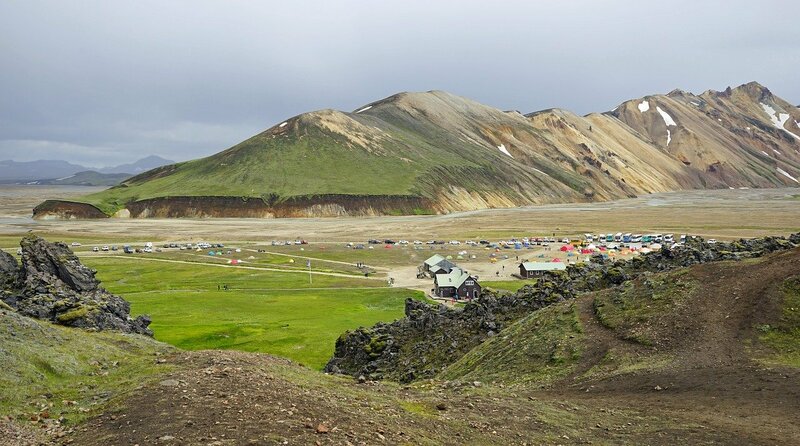 The high tourist season in Iceland is late May to August, so campsites will be extremely crowded during this time with both vans and tent campers. However, the campsites are open from spring to early fall, so any time from April to September is fair game for camping. If you’re planning on camping in a tent, I recommend visiting during the summer months to maximize the chances of warmer weather. However, if you’re going to rent a campervan, you can visit any time from April to October and simply park in the parking lots of the closed campsites (these typically remain open in the off-season). In the winter, several roads in Iceland are closed and therefore are not very conducive for traveling or camping of any kind. In general, Iceland is a pretty safe country. You should not be concerned with violent crime or burglary while camping and driving around. That being said, if you are traveling solo in Iceland, it’s a good idea to enable GPS tracking and let somebody else know your itinerary. Safety from the environment and nature will be your top priority while camping in Iceland. Use common sense judgment when picking a camping spot and keep a close eye on the weather. Even in the summer, you can find yourself stuck in a blizzard while camping, so be sure to come prepared and bring the necessary gear to stay safe, dry, and warm. The easiest and most cost-effective way to get around Iceland is by renting a car. Many people rent 4WD cars, but this can get expensive quickly and you don’t necessarily need one if you are just planning on driving around the Ring Road. However, if you want to drive into the Westfjords or the Highlands, you’ll definitely need that 4-wheel drive. Renting a car is easy and simple in Iceland. Most car rental companies have a presence at Reykjavik Keflavik Airport, and are just a short shuttle ride away.I recommend comparing rates between Hertz, Avis, Budget, and Sixt to make sure you’re getting the best deal. If you’re under 25, rental car underage fees might apply. If you’re like me and don’t know how to use a manual transmission, be sure you book an automatic vehicle ahead of time. These are typically a little more expensive than the basic manual shift vehicles, but it’s 100% worth it to have a car you know how to drive properly. If you like the idea of camping but cringe at the thought of sleeping in a tent, a campervan may be the best option for you. These typically range in price from ~$100+ per day in the high season and are equipped with basic facilities. During my visits to Iceland, I have never used a campervan, but many travelers recommend GoCampers Iceland. There are plenty of other ways to get around Iceland, including biking, taking buses, and hitchhiking. However, I can’t recommend these as they give significantly less flexibility and safety than renting a car. Unless you are an avid mountain/road biker and want to travel that way for the adventure/fitness aspects of it, I recommend saving yourself the trouble and simply renting a vehicle. For clothing, be sure to pack plenty of thermal layers and a waterproof shell, as the weather in Iceland is super unpredictable can change from clear skies to storms in a matter of minutes. I recommend bringing some merino wool base layers to sleep in as well, as it gets pretty cold in the evenings. Of course, be sure to bring some comfy waterproof hiking boots and slip-on shoes for showers. If you’re planning on tent camping… Be sure to pack a tent and rain fly, thermal sleeping bag and sleeping mat, and all of the other camping essentials you’ll need. Not sure what to bring? Head over to our handy camping packing guide for some more guidance. If you’re planning on staying in a campervan… Bring linens or sleeping bags and fold up chairs (in case you want to sit outdoors). Also, be sure to check with your van rental company for any other recommended items to pack. Food in Iceland is stupidly expensive, with sit down restaurants often costing over $30 USD per person for a very basic meal. In our opinion, it’s worth trying a traditional Icelandic restaurant once, but not for every meal during your trip. Instead of eating out, you can save a lot of money on meals by shopping at local grocery stores during your trip. I recommend eating some Clif bars or granola to tide you over for breakfast, and using a camping stove to cook for the rest of your meals. If you don’t feel like hauling your food around, most grocery stores and gas stations sell cheap pre-made food items as well. When you arrive at a campsite, you’ll usually find a parking area next to a large, grassy expanse. Here, you’ll find van campers and tents pitched around the designated areas. Most campsites have a small building where the rangers collect fees, and if there are indoor facilities, they’re usually connected. Be sure to check in with the ranger or manager before pitching your tent to ensure that you’ve paid in advance and that there’s adequate space for you. While some campsites are fairly bare-bones, many of them are equipped with indoor seating areas, hot showers, and running water. Some even have free Wi-Fi, charging stations, and laundry facilities. These camping facilities are pretty upscale by camping standards and are perfect for the first-time or beginner camper. Check out the individual websites of the campsites in Iceland (listed below) for more information. 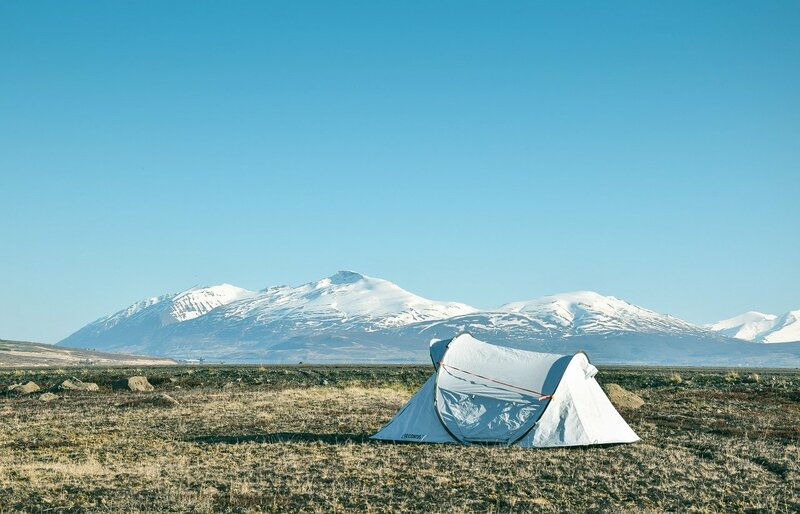 Wild camping in Iceland is technically permitted on uncultivated land for one night at a time. This means that on unowned lands, you can camp with up to three tents in one place for one night at a time. However, it is strictly prohibited on owned land/farms, so if you’re going to this you have to be careful of where you set your tent down. If you want to try wild camping, be sure to keep an eye out for posted signage, and don’t jump any fences or gates to find a campsite. These areas are likely off limits. Additionally, parking is somewhat of a gray area. You’ll often see people parked on the side of the road in Iceland, but this is actually illegal in many areas. Because it’s difficult to tell at times where land is owned or uncultivated, I recommend avoiding wild camping whenever possible. However, if you’re still curious, this site has some more information on the regulations surrounding wild camping in Iceland. If you go camping in the summer, the midnight sun will be in full-force. If you’re sensitive to light while trying to sleep, bring a sleeping mask, a Buff, or other eye cover so you can get a good night’s rest. There’s practically no dangerous wildlife in Iceland. Don’t worry about bringing bear spray or things like that – you won’t need it. There aren’t many trees in Iceland, and the ones that exist are very short and thin. Don’t expect to find places where you can hang a hammock or camp in a hammock tent. Near some of the lakes in Iceland, you’ll find hordes of midge flies. These little guys are harmless but get EVERYWHERE, so if you aren’t okay being near bugs, avoid camping near lakes. When the weather is really bad, you might be tempted to stay in a guesthouse for a night. If you do this, you can save money by waiving the use of linens and just using your sleeping bag instead. Booking.com has several listings for guesthouses in Iceland that you can book last-minute. This is a preliminary and growing list of campsites in Iceland that are accessible in areas many travelers would visit. Prices are per adult, per night, not including extra amenities or fees. We’ll continue updating this list as we find more! Camping for the first time? Here’s our guide on what you need to know. Need help packing for your trip? Here’s our preferred gear list for camping. Want to be a smart and secure traveler? Be sure to pick up some travel insurance before you go. Want to narrow down your choices? Here are 9 campsites on the Ring Road to help you get inspired. 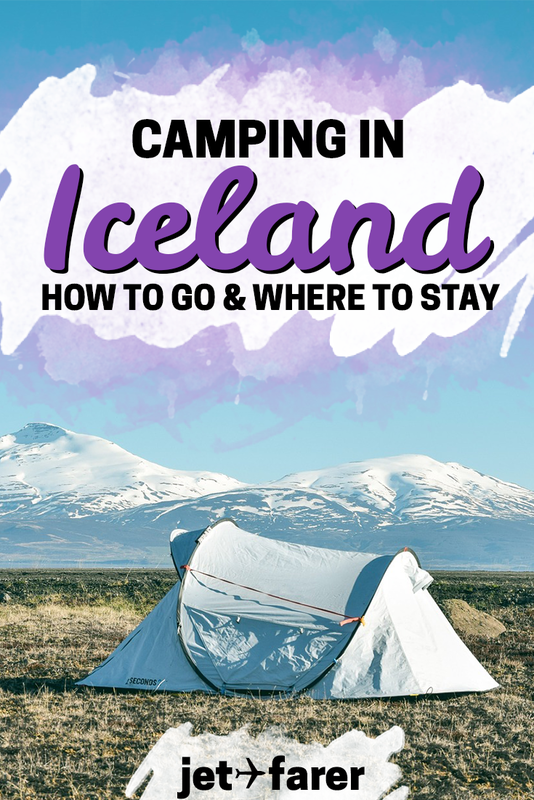 Guide to Iceland has a pretty good overview of camping options in Iceland for more information. More questions? Ask away in our Jetfarer Facebook group! We plan a camping trip in Iceland during the first week of August. Do we need to reserve campsite? If you have a phone number for the campsite you’d like to go to, you can try calling ahead. However, most of the campsites we went to in Iceland were first come first serve, and there was plenty of space even when we arrived later in the evening. Thank you for sharing us nice tips. I have a plan to go Iceland so your tips are useful for us. Thank again.